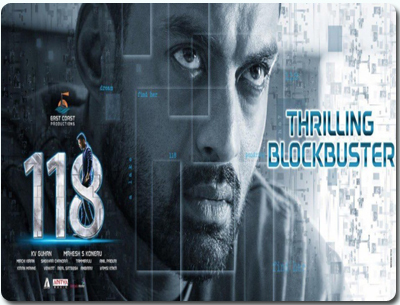 118 is an Indian Telugu language action thriller film directed by K.V Guhan and it got released on 1st march 2019. The film stars are Nivetha Thomas, Kalyan Ram, ShaliniPandey. Nivetha Thomas plays the lead role. The film is produced by East Coast Production. Gowtham (Kalyan Ram),is an investigative journalist. He loves off-roading, spending time with his loving fiancé Megha (Shalini Pandey) . He gets a dream when he stays in room no 118 in a resort. In his dream, he sees a girl getting beaten and a car being thrown into lake that a girl he has never met before. He uncovers a conspiracy that goes beyond a missing girl mourned by her father. Gowtham (Kalyan Ram), is an investigative journalist. He loves off-roading, spending time with his loving fiancé Megha (Shalini Pandey). He gets a dream when he stays in room no 118 in a resort. In his dream, he sees a girl getting beaten and a car being thrown into lake that a girl he had never met before. In his real life as well with connection to the number 118. He decides to investigate the case himself along with his friend and fiancé. Who is the girl and what does she have to do with Gautam and what is the story in room no 118 is the plotof the film. Meanwhile his wedding is fixed with Megha. He is keener on finding about this girl who turns out to be Aadhya (Nivedha). The movie is produced by East Coast Production. The music of the film is composed by Shekar Chandra.